January 22, 2017 (San Diego’s East County) – Cleveland National Forest Foundation (CNF) and Save Our Forest and Ranchlands (SOFAR) filed a lawsuit against San Diego County last week in San Diego Superior Court. The suit argues that Supervisors adopted an amendment to the Forest Conservation Initiative (FCI) based on a faulty environmental analysis and failed to identity ways to minimize impacts of the new plan. December 23, 2015 (Alpine) –Attorney Marco Gonzalez has filed an appeal with County Supervisors on behalf of environmental groups and neighbors of Covert Canyon in Alpine. If the Planning Director's decision stands, he argues, it would set a precendent that could subject residents across vast areas of the County to neighbors opening up similar commercial shooting ranges. The appeal contends that it was illegal for the Planning Director to issue an order reclassifying the zoning ordinance defintion of “law enforcement” to include military and law enforcement firearms training at Covert Canyon, a mountain meadow surrounded by Cleveland National Forest, without reveiw under the California Environmental Quality (CEQA) Act. July 10, 2015 (San Diego's East County) - The County of San Diego, Department of Environmental Health (DEH) has issued a Boil Water Order and Public Notification for Oak Grove Complex located at 37560 Highway 79, Warner Springs, CA 92086 effective immediately. The system serves potable water to 2 residences, 2 fire barracks and 80 campsites. 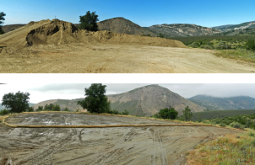 April 26, 2015 (Cleveland National Forest) – The County has begun a major cleanup of dirt dumped along Boulder Creek Road that polluted a federally protected watershed in response to an East County Magazine investigation. Eagle Peak Friends and Collaborators, a concerned citizens' group, posted a video on its Facebook page documenting massive quantities of dirt dumped along Boulder Creek Road inside Cleveland National Forest in San Diego’s East County. The group contended that the County is responsible for dumping 20,000 cubic yards of dirt from road-grading inside the federally recommended Eagle Peak Wilderness area. Before our inquiry, nothing appeared to have been done to halt the county’s actions, which had gone on for many months or more, a whistleblower told ECM. September 16, 2014 (East County) - San Diego has many rural roads, many of them maintained by the Bureau of Land Management (BLM). The California Department of Transportation (CALTRANS) maintains other roads. July 17, 2014 (Cleveland National Forest)--Due to high fire danger, Cleveland National Forest has announced elevated fires restrictions starting Friday, July 18th. The change is due to dryer fuel conditions, higher temperatures, and the likelihood of small fires becoming big fires. READER'S EDITORIAL: A BEHIND-THE-SCENES LAND GRAB? July 6, 2014 (San Diego’s East County)--I am a property owner surrounded by the Cleveland National Forest on Boulder Creek Road. My land represents the majority portion of my personal financial holdings. Up until 1993, county regulations allowed property owners in my area to divide their lands into 20 acre parcels. We lost this ability in 1993 when voters approved the Forest Conservation Initiative (FCI). Read more about READER'S EDITORIAL: A BEHIND-THE-SCENES LAND GRAB? February 26, 2014 (San Diego’s East County) – Readers across East County have sent photos and video of a large controlled burn yesterday in Rancho Cuyamaca State Park, voicing outrage over the burning of habitat including mature trees, given than 99% of the pine trees in the park burned during the 2003 Cedar Fire. Questions have also been raised over why the burn was allowed in windy conditions, why a helicopters was dispatched to use water from Lake Cuyamaca on a controlled burn, and why more notice was not provided to the public and the press that a major controlled burn was underway by State Parks in conjunction with Cal Fire.